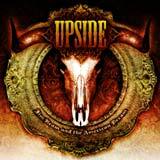 Upside is a four piece band from Texas, with Jim Beam and the American Dream being the band's third album. The band has been doing well on the club scene in their region, but the band is planning a national tour in 2007. The promo sheet that came with this CD recommends this album for fans of Motley Crue, Stone Temple Pilots, AC/DC, and Led Zeppelin. There may be some Stone Temple Pilots influences, but I would disagree with the other three bands mentioned. Upside have certainly created their own sound, but it's more in the vein of 90's pop/punk bands like Green Day mixed with 80's hard rock guitar work and other musical influences, but with a very contemporary feel. According to the promo sheet, the band has developed quite a rabid following in their region of the country. I'm not ready to call this band the next big thing by any means, but I can tell that there is certainly a market for this type of music out there. Upside deliver on their end of the deal with music that is both inspired and very well performed. Upside would fit in very easily on any modern rock or college radio station here in North America. For me, those type of bands are usually bland and completely uninteresting to me. The difference that I hear in this band's sound that separates them from the mountain of boring, uninspired modern rock is their attitude, and ability to deliver some interesting guitar work. The riffs delivered throughout the album are in your face, catchy, and very driving in nature. As a result, each of the songs has a very solid backbone. One thing that many modern rock bands seem to shy away from is the big, loud guitar solo. While not overabundant by any means, good ol' screaming solos can be found plentifully on this album. The rhythm section is hard hitting, with the bass guitar pounding along in perfect harmony with the heavy riffs; what a wall of sound this generates! Furthermore, the drum work is inspired, interesting, always managing not to become stale or predictable. Big hooks and a good sense of melody are evident throughout the album. While some songs clearly stand out ahead of the others, the band never falls flat on their face to deliver a bad song. The attitude and energy of this band is authentic, and that bleeds through on each and every song. While I do find some of the hooks and compositions to be a bit mediocre, the energetic play and genuine passion of the band salvages even the weaker tracks. When the band clicks on all cylinders, they really know how to write a great song. Does This Make Me Look Dead?, Campfire Vampires, Puppets, Flatline, Watch It Fade, and Hit The Ground are the cream of the crop here. As I said, the other songs aren't bad, they're just not quite up to the level as the aforementioned. Stylistically, Upside frequently leans toward the pop/punk side of hard rock. Of course, up tempo Green Day comes to mind. However, the attitude and quality of musicianship found on this album certainly warrant a favorable comparison to Velvet Revolver as well. While this album won't appeal to all fans of hard rock, the ones who do enjoy modern rock with a punkish attitude will certainly find a lot to like here. I have to say that the songs are universally well played and delivered with balls and a sincere attitude. As I pointed out, some songs clearly rise above the others, but as a whole, this album is sure to please fans of this particular genre. As I must admit, I am devotee of the more classic sounding, 80's grounded hard rock as many of you know. However, Upside has shown enough promise on this album to interest even someone like me in what they're doing. This is one of the few modern rock bands that manages not to sound stale, corporate, or lifeless; they actually get it right.